Sip on a spicier version of this classic summer beverage when you add jalapenos to a cherry limeade. Make a simple syrup by stirring sugar in to hot water until dissolved. Set aside to cool. 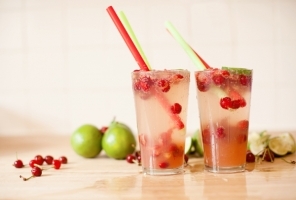 In each glass: Pour half of the lime juice, stir in 1/4 cup simple syrup. Add the cherries and jalapeños, then muddle everything together. Top off with ice cubes and then pour in the club soda. Stir to combine. Taste and adjust sweetness/tartness as needed by adding a pinch or two more of sweetener or a dash of extra lime juice. Note: We left the whole cherries in our limeade, but feel free to strain for a "pulp-free" beverage.